While each person using Observer can log markers, marker scores, and text notes, only one Observer designated as the task logger can log tasks and task scores. The task logger is defined in the study configuration. For details on defining the task logger, see the Morae Recorder Help. 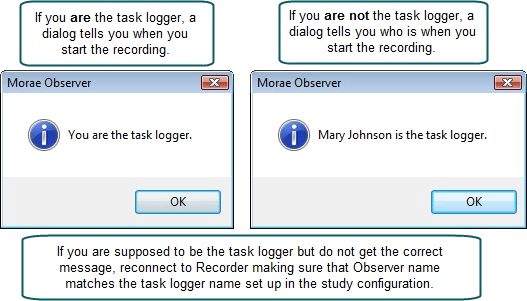 The task logger logs tasks by entering start and end markers at the beginning and end of the tasks the participant performs during the recording. If you start a task too early, click the Restart button to restart the task. After you start a task, click Cancel to abort the task. A Canceled Task icon appears in the log. If you end a task too early, click Start and select Add to <task name> in the dropdown list. Each time you log an Undefined Task, another Undefined Task appears in the dropdown. Undefined tasks are numbered and you can define them later in Manager. 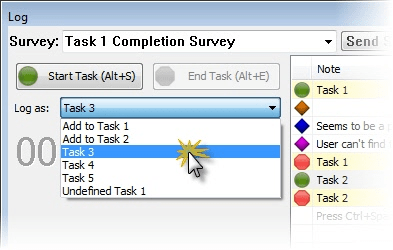 As the task logger, click Start Task. Select a task from the Log as drop-down list. Add markers during the task, as needed. Send a task survey, if applicable.